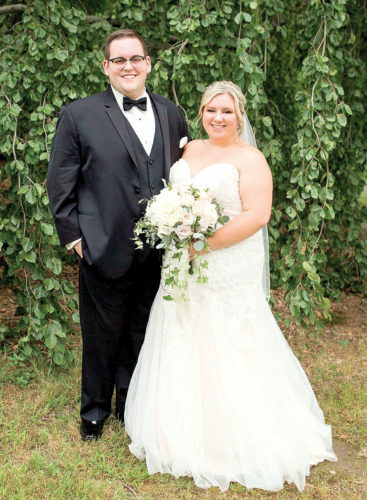 EAST LIVERPOOL – Chelsey Renee Stockdale and Ryan Earl Stowers were united in marriage on Saturday, July 20, 2013, at the Trinity Presbyterian Church in East Liverpool. 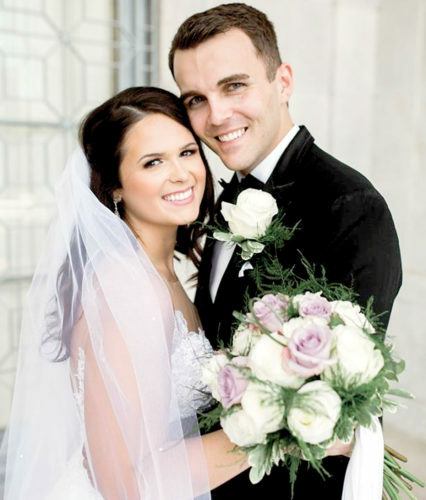 The bride is the daughter of Michael and Theresa Stockdale of East Liverpool. 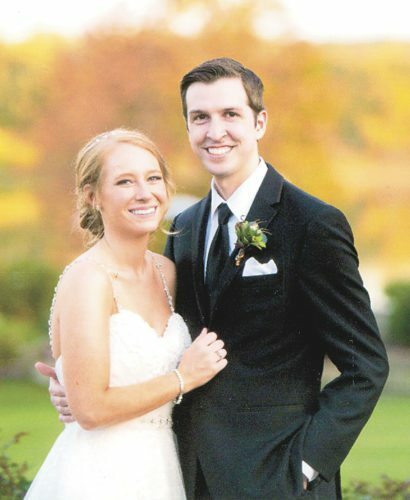 The bridegroom is the son of Brian Stowers and Davena Stowers of East Liverpool. The Rev. Steve Cramer officiated for the double ring ceremony. The bride was escorted to the altar by her father, and given in marriage by her parents. She wore a strapless diamond white Maggie Sottero Selina gown with an airy allure of a fantasy-inspired ball gown with horsehair trimmed ruffles floating throughout the gathered tulle skirt which was adorned with glimpses of embellished lace and Swarovski crystals. The gown featured a sweetheart neckline, asymmetrical bodice and handmade flowers with Swarovski crystals, finished with a corset closure. She carried a handheld bouquet of calla lilies, tiger lilies, purple and green hydrangeas, accented with forget me nots with crystals and a white satin wrapped stem accented with Rhinestone bling wrapped around the stem of the bouquet. Marissa Yeager Steele of East Liverpool, lifelong best friend of the bride, served as matron of honor. Bridesmaids were Ashley Sullivan Butler and Emily Mahon, both of East Liverpool and friends of the bride; Brittany Champion, of Irondale, friend of the bride; Emily Swogger, Jackie Morris and Brittany Bright, all of Wheeling and friends of the bride; Lindsay Hartzell Staten of Scio, friend of the bride; and Shelby Mackall Stowers of Havelock, N.C., sister-in-law of the groom. Esmaria Ivette Heck, of East Liverpool, cousin of the groom, and Brooklyn Cowart, of Chester, friend of the bride, were flower girls. The groom was attired in a Joseph and Feiss white dinner jacket with pleated black pants, platinum vest and tie and spectator shoes. 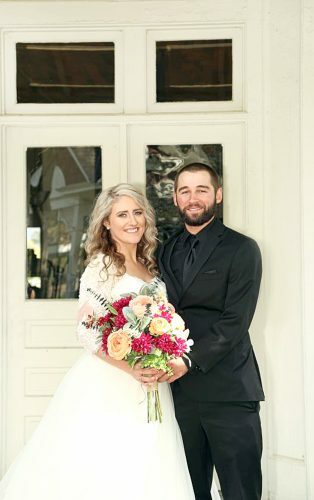 Dylan Stowers of Havelock, N.C., brother of the bride, served as best man. Serving as groomsmen were Timothy Moore of Iowa, friend of the groom; James Lonkert of East Liverpool, cousin of the groom; Robbie Rowe of East Liverpool friend of the groom; Joshua Honaker, Roger Glaspell and Marcus Broadwater, all of Logan County, W.Va. and Nick Benavides of Kanawha County, W.Va., all friends of the groom. Liam Ryan Jordan, of East Liverpool, cousin of the bride was ring bearer. A reception immediately followed at East Liverpool Country Club. A rehearsal dinner, hosted by the groom’s parents, was held at Levanti’s Italian Restaurant in Beaver, Pa. on Friday, July 19. 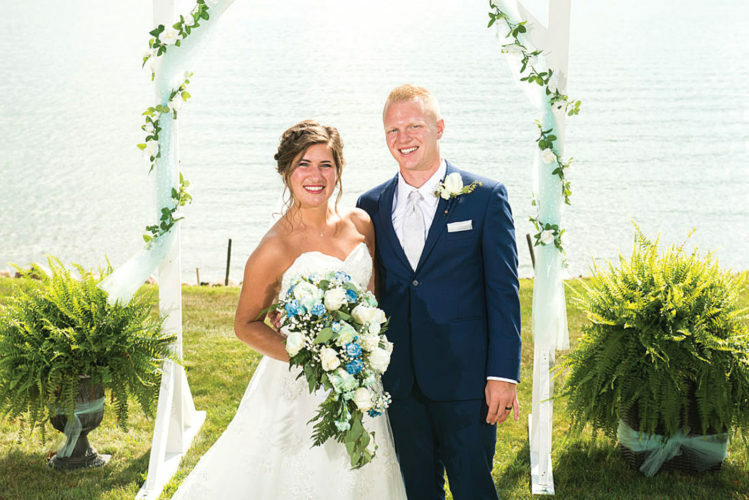 The bride is a 2008 graduate of East Liverpool High School and a 2012 graduate of West Liberty University with a Bachelor’s Degree in Elementary Education and Special Education. She currently is a K-4 Special Education teacher in Chapmanville and the head high school volleyball coach at Logan High School. She is also currently attending West Virginia University working toward her Master degree in Special Education. 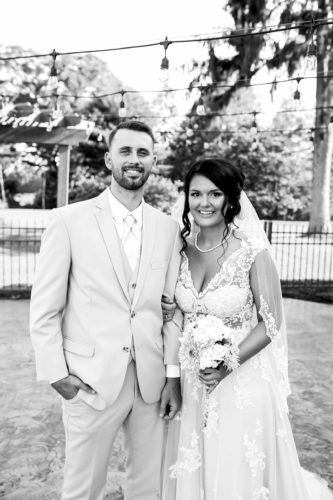 The groom also a 2008 graduate of East Liverpool High School and a 2012 graduate of West Liberty University with a Bachelor’s Degree in Criminal Justice. In addition, he is a graduate of the West Virginia State Police Academy. He is currently a West Virginia State Trooper. The couple is residing in Chapmanville, W.Va. after a honeymoon trip to the Carolinas.